Who doesn’t love a burrito bowl? Personally, I could eat burrito bowls three times a week and not be mad about it. This particular burrito bowl is especially awesome because it’s cheap, quick to put together, nutritious, and (obviously) delicious. 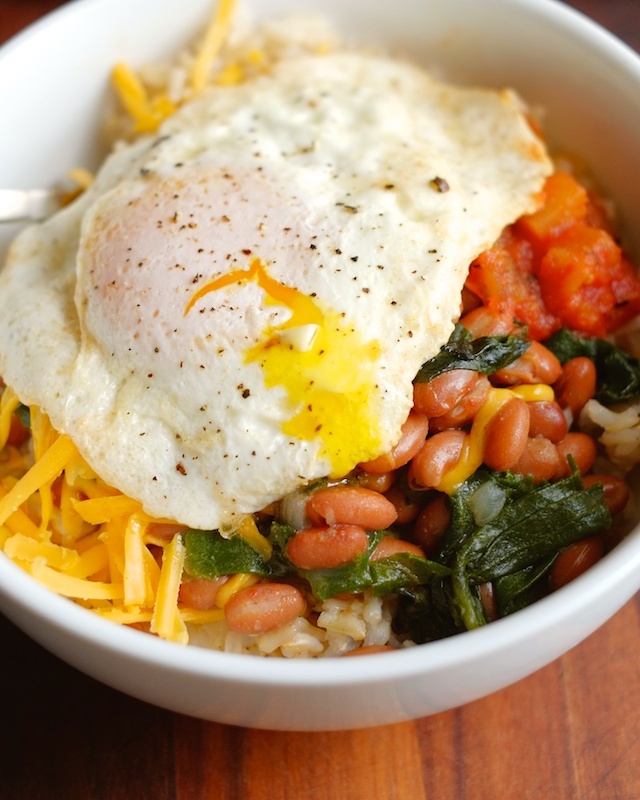 The success of this dish depends on the beans. My favorite is pinto, but black beans would definitely work. 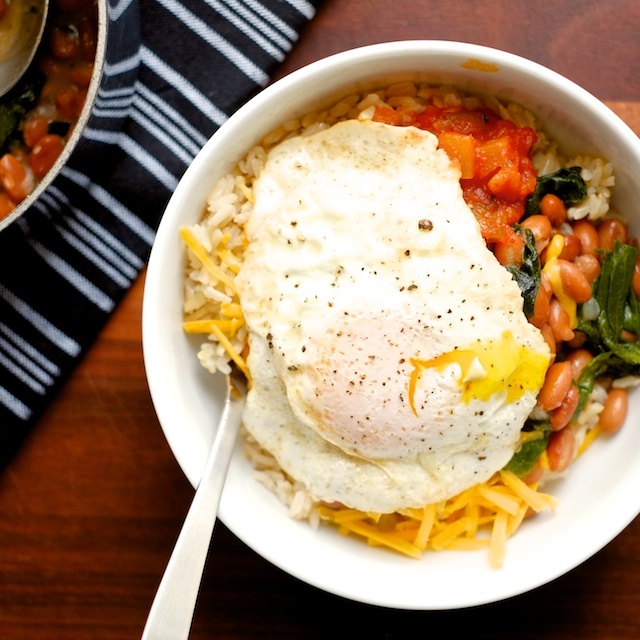 I know it’s hard to get excited about beans but trust me, these bring a lot of flavor. Oh, and I snuck in some spinach because you need it, and I know it’s not conventional but it isn’t very intrusive either and really, you need it. Rice and beans are staff-of-life level foods, with brown rice packing in extra fiber and combining with the beans to make a complete protein. Spinach brings iron, vitamin k, vitamin a, folate, and we could actually be here all day. It’s kind of a cliche in the foodosphere, but good advice is good advice: you should put an egg on it. For taste reasons mostly (yaaaaahm), but they’re also very protein-y and contain choline and lutein which are good for brains and eyes, both of which make college easier. 1. Make brown rice according to Alton Brown’s baked rice recipe. It takes an hour, but it’s the only way I’ve found to get brown rice to taste good and have a nice texture. It is so worth it. 2. In a medium-sized pot over medium heat, cook onion in butter until it’s translucent. Check out my knife skills tutorial if you need a good onion-dicing method. Add minced garlic, cumin, and both cans of beans (I say lazily drained because you need a little bit of the liquid). Let the beans heat over medium until their liquid begins to bubble, and reduce to low. 3. Add frozen spinach and heat until the spinach is warmed through. Season beans with salt and pepper to taste. 3. 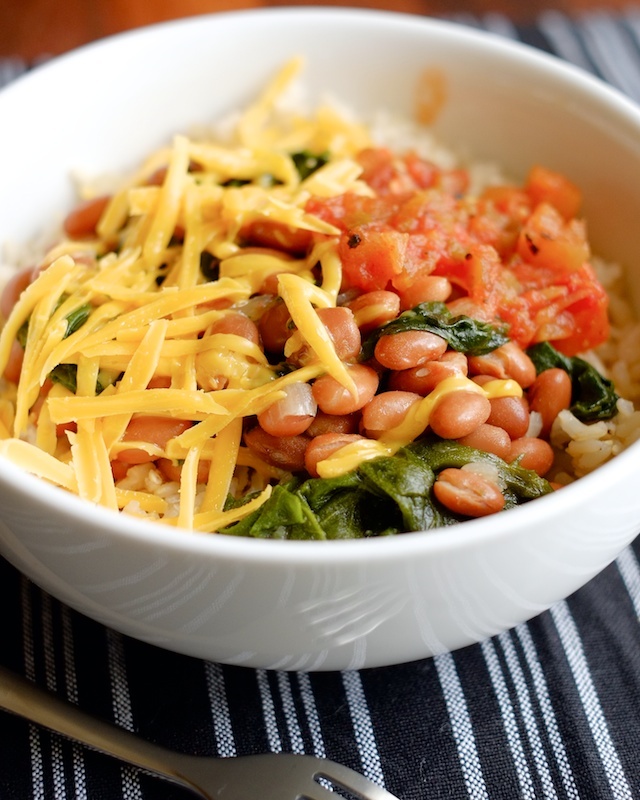 Pile rice into bowls, top with beans, cheese, salsa, and an egg (if you want extra protein). Hot sauce, avocado chunks, or sour cream would also be tasty. Leftover rice and beans keep in the fridge for 3-4 days, or you can freeze them (in ziploc freezer bags) for a few months. Re-heat rice in the microwave, and reheat beans in a pot over low heat. If you have trouble getting a solid block of frozen beans out of their plastic bag, run it under hot water until the outside layer softens.